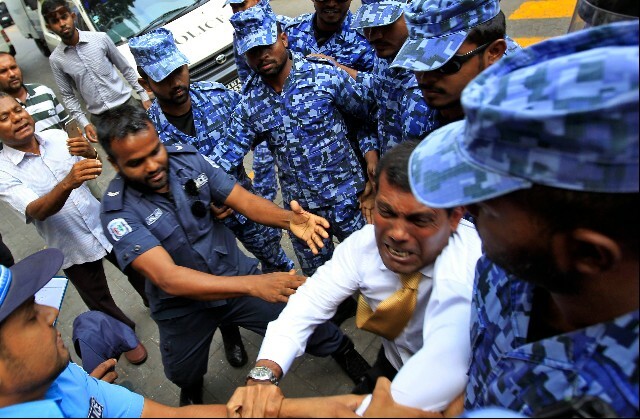 The arrest of former President Mohamed Nasheed on trumped up terrorism charges on 22 February 2015 sparked immediate protests around the country, mainly in the capital city of Male’. Following his arrest and during the unlawful trial that sentenced him to 13 years in prison in a rushed procedure, several cases of arbitrary arrests, unlawful detention, intimidation, and obstruction to assembly and peaceful protests as well as violations of free media have occurred and are continuing to take place with every passing day. The following highlights several such cases as of today. Nasheed manhandled by police officers in front of the Civil Court as he approached media personnel. – Since 19 February 2015, over 120 individuals have been detained from peaceful political demonstrations. – Over 50 of those arrested have been released on condition that they do not attend political rallies for a period varying from 30 to 60 days. This is in clear violation of the constitutionally stipulated right to assembly in Art. 32 of the constitution. Some have filed the issue with the Human Rights Commission of the Maldives requesting to investigate violation of their right to peaceful assembly. – Opposition MP Fayyaz Ismail who refused to accept this unlawful condition at his bail hearing was imprisoned for a further 15 days. Was released on 21 March 2015, without any conditions by the same judge. – Art 32 of the Maldives’ constitution guarantees the right to assembly without prior approval from the state. Authorities continue to arbitrarily manipulate regulations governing rallies by demarcating new areas of Male’ city as security zones, confiscating sound systems by 11pm and forcefully dispersing protests at midnight. – Despite the Employment Act and international conventions ratified by the Maldives, which guarantees the right to association, several employees in State Owned Enterprises (SOE) have been given warning for attending opposition protests. 1 individual has been dismissed from his position. No action has been taken towards employees who attended pro government rallies. – Following a spate of violent attacks against expatriate labourers, members of the expatriate community were planning to hold a gathering to express concern about their worsening security situation. They were told by the Department of Immigration and Emigration that any expatriates with a work permit would be deported if they took part in any protests. – Maldives Association for Construction Industries (MACI) has announced for foreign employees working in companies that are members of the association to refrain from participating in any protests that may take place. In this announced MACI also said it would be difficult to attain employment quota for companies if their employees take part in protests. – Government has repeatedly denied permission to opposition party Maldivian Democratic Party (MDP) to hold rallies in any of the public grounds under the Ministry of Housing. – President, Vice President, members of the MDP Women’s Wing and two female members of the MDP National Council have been charged with the Obstruction of Police Duty. Media reports that their cases have been sent to the Prosecutor General for prosecution. – Increased level of political violence in the country since the arrest of President Mohamed Nasheed on 22 February 2015. – Members of Parliament and senior MDP officials receive death threats regularly. – Knife wielding gangs, who operate in an environment of total impunity, frequently attack pro democracy events and MDP rallies. – The MDP has lodged multiple cases with the Police and the Elections Commission regarding these attacks, to no avail. – Many of these attacks on MDP events have taken place directly in the presence of Police who have failed to prevent and/or take action against these individuals. – The close collusion between senior government officials and criminal gangs in addition to the inaction of the Police leads the MDP to believe that much of this violence is politically motivated and state sponsored. – Of the individuals who have attacked MDP events, none have been held accountable. – Members of the MDP are being investigated for alleged terrorism charges, including MDP’s deputy leader, a former MP, members of the MDP’s governing body and a number of activists. – The media reports that the Prosecutor General is pressing charges of “corruption” against 5 former Cabinet Members of the MDP government. February 27: During the biggest rally ever held in the Maldives, gangs entered a peaceful sit in from behind the police line and attacked protestors and vandalised sound equipment. Police, instead of arresting the gangs arrested protesters from the scene. March 13: MDP held a sit in while President Nasheed was being unlawfully sentenced to 13 years in jail for trumped up charges of terrorism. Gangs threw crude oil, carried wooden planks and knives and attacked protestors right in front of the Police line. 15 March: MDP’s pickup was vandalised by knife wielding thugs, who smashed the windscreen and damaged the sound equipment stored on it. Former MDP MP Ibrahim Rasheed, at the scene, was told that if he tried to stop them, they would kill him. They also smashed a camera of one of the journalists covering the event. March 17: Government officials attacked a silent protest at the national gallery after the education ministry removed two paintings depicting President Nasheed from an exhibition on ‘freedom and independence’. The Police present at the scene did not stop these officials. The same night, crude oil was thrown at the MDP pickup and people gathered in front of the Party office for a rally, by two individuals. Four individuals on two motorbikes entered the protest area and threatened protesters, and attacked a cameraman. Gangs threw petrol at MDP protestors. Several male Police officers arrested 2 female MDP protesters from the scene violently, causing injury, and kept them overnight in Male’ Atholhuvehi jail in handcuffs without medical treatment before being taken to the court where 5 day house arrest was ordered upon them. Two attackers who were also arrested at the scene were treated differently, with no handcuffs, their requests for food and water catered, and received a 3 day house arrest order from the court. April 1: A government official – an employee of the Presidents Office – attacked MDP demonstration and threatened protestors. 22 February 2015: Opposition MDP MP Ali Azim was arrested from a peaceful peaceful protest, protesting the arrest of President Nasheed earlier in the day. Police announced that MP Azim was “intoxicated” during his arrest. However, this was not mentioned when he was brought to court for remand. MP Azim was kept in detention for 11 days and released on the condition that he cannot join protests or gatherings for 60 days. 6 March 2015: Opposition MDP MP Fayyaz Ismail was arrested during a demonstration and held in remand detention for 15 days after refusing the Criminal Court’s condition for release of not attending protests for 60 days. 22 March 2015: Police obstructed several members of the public from submitting a letter at the criminal court requesting they hand over the full case report of President Nasheed’s trial to him. During this incident, MP Falaah was detained for approximately half an hour before being released. MPs and members of the public were then escorted one by one by the Police to the criminal court to submit their letters. 25 March 2015: MP Ahmed Mahloof arrested from an opposition protest. Eyewitnesses at the scene state that excessive force was used by the Police when they arrested MP Mahloof. His detention was extended for 5 days. The Police state that he obstructed Police duty. Maldives press freedom has declined to pre-2008 levels dropping to 108th place in the Reporters Without Borders (RSF) Press Freedom Index for 2014. In 2009-2010 Maldives saw dramatic improvements in press freedom, rising to 51st and 52nd respectively. The ranking slipped to 73rd in 2011 and 103rd in 2012. 8 March 2015: Video journalists and news reporter from Raajje TV were arrested for filming a meeting of Judge Abdul Bari Abdul Yoosuf, a judge presiding over President Nasheed’s trial and the state Prosecutor General in a public café. They were arrested by police after being threatened by members of a local gang. They were detained for hours and forced to delete video footage. 9 March 2015: Opposition aligned TV Station, Raajje TV was barred from observing Criminal Court trials against President Nasheed and Defence Minister Mohamed Nazim. 10 March 2015: Maldives Media Council condemned the decisions of the Criminal Court to bar Raajje TV from criminal court hearings as well as police arrest of journalists and forcing them to delete their footage. 13 March 2015: Media physically obstructed from leaving the Court house during recess period of the final court session of Nasheed’s trial at the Criminal Court, despite repeated requests. They were held inside the Court house for over an hour and a half. Three journalists filed a case at the Police against the court officials who held them without case. This case was dismissed by the Police. 24 March 2015: A reporter was arrested while covering an opposition protest. His detention was extended for 5 days, on the grounds that he obstructed Police duty. 25 March 2015: Raajje TV reporter Wisam and cameraman Zareer were arrested while covering an opposition protest. They were brought to court handcuffed the next day and had their detention extended for 5 days in inhumane conditions in Dhoonidhoo detention centre. Police accuse them of obstructing Police duty because of the light used by the cameraman. All material on this website are made available for and by supporters of President Nasheed. Copyright © 2015 Free President Nasheed, Maldives.